I thought I’d begin today with an entry on military geography, specifically how geography played a huge role and affected the battles of Manassas/Bull Run during the Civil War era in the United States. In 1861, the United States broke out into a Civil War between northerners and southerners that led to many battles and skirmishes which carried on for several years. This war was based on geopolitical reasons that led to the South wanting to break away from the Union. The specific emphasis of this posting will be on the first and second battles of Manassas. The first battle began in July 1861, and was one of the main battles with land forces. It would shape the following battles of the war between the Confederate (south) and the Union (north). The second battle began in August 1862 with the hopes that the Union could claim victory and take control of Richmond. However, both battles contributed to a Confederate victory mainly due to the geographic expertise of the involved Confederate generals; as well as the lack of geographic expertise and poor organizational skills of the Union generals. Furthermore, both armies thought these battles would be easy victories that would end the war early. Historically, this was not the case, and more battles continued to unfold throughout the following years. It is important to recognize the geographical factors that assisted in altering both outcomes. Knowing the lay of the land is a very important factor when engaging in war because it will ultimately determine planning, operational, and tactical stages of a war. For this to actually matter, generals and commanders must fully utilize their geographic resources to gain an advantage over their enemy. The geography of an area influences choke points, order of battle organization, key routes, defensive positioning, and offensive positioning. In this posting, I will describe the geographic basis for both battles; and indentify how key geographic features played an effective role in determining the course and outcome of both battles. For the purpose of this posting, the Prince William County corridor (between the Bull Run/Pond Mountains and Bull Run creek) will be the main focus of geographical study, and the main location for the battles. Nevertheless, the two campaigns actually began and ended well past these boundaries in the Virginian counties of Culpeper, Rappahannock, Fauquier, and Fairfax. relation between the points. This map uses the WGS1984 datum. Maps during this era were not easily obtainable and not well organized compared to today’s standards of cartography. Most maps used by commanders during the Civil War were usually hand-drawn and were restricted to specific areas of interest. This poses potential problems and benefits for the military. The problems result from the limited vision of only looking at the immediate area. In order to understand the complete benefits of a map, an overview is needed to look at the bigger picture. Obstacles may pose threats if they are not depicted on a map prior to utilizing a route to gain access to the specific area of interest. Evacuation routes or choke points may be difficult to plan if a commander is walking into the unknown and may be surprised by an ambush or a dead-end. In addition, the maps were not always reliable. Based on my observations, relative distance was most likely incorporated in to most maps of this time which does not rely on accuracy because it is not mathematically represented within a scale or a map projection. The beneficial part of a map catering to a specific location is the increased knowledge of a commander to gain insight on where their offensive and defensive position will be placed in order to maximize their chance of success. Although in regards to the aforementioned problems, the maps used for the battles of Manassas were mainly guides and were not designed to be taken literally. The Union army presumably recognized these problems and decided to venture into establishing a balloon corps which would provide mapping and intelligence to the Union commanders. This type of aerial surveillance provided the Union commanders with information regarding the terrain, lines of communication, and Confederate army order of battle/movement in the regions of Virginia being observed. The Union’s first opportunity to use the balloons was in the first battle of Manassas, where Thaddeus Lowe launched his first balloon, “Enterprise,” from Alexandria to observe enemy movement and map out the terrain of Northern Virginia. However, problems arose with the use of this balloon due to various mechanical problems and lack of untrained aeronauts. Eventually, in 1862, aerial surveillance became fully operational and was able to examine geographic areas. This type of geospatial intelligence may have assisted General John Pope of the Union in examining Confederate movements around Bull Run; however, due to contradictory intelligence reports from Washington, D.C., they did not prove to be as useful as they could have been. As a result, these various reports most likely created confusion among the Union generals in the second battle of Manassas. The topography of the Prince William corridor is mountainous in the west and subsides in elevation in the east. The central and eastern part of the corridor is consumed by rolling hills, forests, ridges, and farmland. The major mountain range in this region is the Blue Ridge Mountains and has bands stretching southwest to northeast. The easternmost band of the mountain range is named the Bull Run Mountains and travels from the Rappahannock River northeast to Maryland. The Bull Run Mountains are located at the western part of the Prince William corridor. The southern portion of the Bull Run Mountains where the ridgeline descends is called the Pond Mountains. The descent, also known as Thoroughfare Gap, is the only area for many miles that can be easily passed through the mountain chain because these mountains have sharp and rugged ridges that are impassible. Besides the mountains, the remainder of the corridor consists of smaller, non-protrusive ridges and hills which do not impede soldier movement significantly. The following key features in this part of the corridor are as follows: Chinn Ridge, Henry Hill, and Matthew’s Hill which all have an elevation of approximately 280 feet above sea level, and Stony Ridge which was approximately 335 feet above sea level. The geology of this area has laid the framework for the terrain and ultimately has allowed each side to take advantage of concealment techniques. The majority of the battles were fought in the lower elevations in an area known as the Culpeper Basin. At the base of the Bull Run Mountains is a minor fault line which during the Mesozoic era ruptured and formed a break in the rocks. This contributed to the basin changing the landscape from rugged terrains to rolling hills. Sedimentary rocks make up most of the corridor with siltstone that may be overlaid with red and gray shale. In addition, the sedimentary rocks created open and smoother terrain which is beneficial for transportation networks and agriculture. Most of the soil around the actual battlefield had not been through metamorphosis; therefore it also created a suitable area for farming and increased trafficability. West of the fault line is diabase, which are rocks that have many dark and clay minerals providing many nutrients for vegetation to flourish. These types of rocks are hard; and have an excellent resistance to erosion which allows rugged terrain and ridges to be formed. Stony Ridge, which was formed at the end of the diabase, is extremely important for tactical purposes and lies in a wooded area. This ridge proved to be a viable cover for the Confederacy in the second battle of Manassas. The hydrography of the area is plentiful and provides many offensive and defensive tactics for the soldiers of both battles. Mainly fords and creeks were used as barriers, crossing points, routes; thus providing important, strategic factors for soldier movement. Most of the creeks ran southeast towards the Chesapeake Bay. The three most significant creeks that influenced both the Confederate and Union soldiers were Bull Run, Broad Run, and Dogan Run. Fords along these creeks became key geographic areas for the battles. In my opinion, the troops that controlled the fords would increase their soldier movement, and optimize their offensive battle tactics in order to attack their opponents’ flanks with ease. Lines of communication in the Prince William corridor provided support to the armies of the battle at multiple levels: strategic, tactical, and operational. There were several key roads and railways that contributed to the battle. The following lines of communication were observed upon my field visit to the battlefield. Key roads were used to assist the soldiers on both sides in their navigation from one point to another point for long distances. Roads were also used as reference points to assist troop movement between the different local areas of battle such as prominent hills and ridges. Some of these key roads were Warrenton Turnpike (Route 29) which was located between Thoroughfare Gap and Centreville in an east/west direction. The Manassas-Sudley Road was located between the hamlet of Sudley and Manassas Junction in a north/south direction. 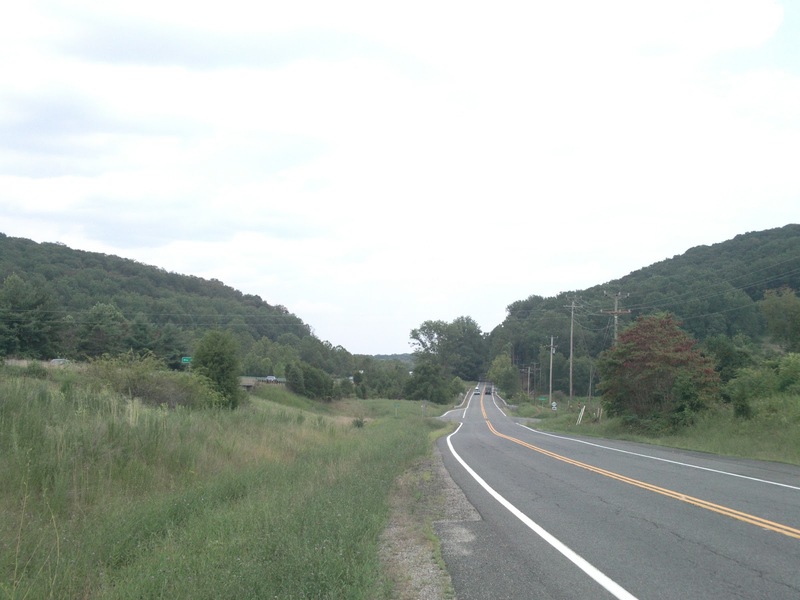 Lastly, the Groveton-Sudley Road was located between Sudley and the hamlet of Groveton in a north/south direction. In addition to the Warrenton Turnpike which interconnected multiple counties, there were also two prominent railways that led the armies to the corridor. The first railroad was the Orange & Alexandria (O&A) Railroad which ran between Culpeper and Alexandria, Virginia. The second railway was the Manassas Gap Railroad which ran between Front Royal, Virginia and Manassas Junction. There was a third railway that began construction prior to the war; however, due to a lack of funding, the railroad was unfinished during both battles. The unfinished railroad was located slightly southeast of Stony Ridge and became very beneficial to the Confederate army in the second battle because of the concealed position it offered the soldiers. Preparations among Union and Confederate commanders were beginning for what would be considered the first Battle of Manassas. The majority of Confederate armies traveled slightly north of Richmond to the battlefield area by several routes and modes of transportation. The Confederate infantry traveled by train, while the Confederate cavalry and artillery took advantage of several major roadways to the battlefield site. Other Confederate soldiers traveled from the Shenandoah Valley in the west via Manassas Gap Railroad. The Union armies mostly traveled west from various locations in Fairfax County and along the Potomac River. Upon arrival to the battlefield on July 16, 1861, the Confederate army defensively positioned themselves along several key choke points on the western side of Bull Run because of their familiarity with the terrain. General P.G.T. 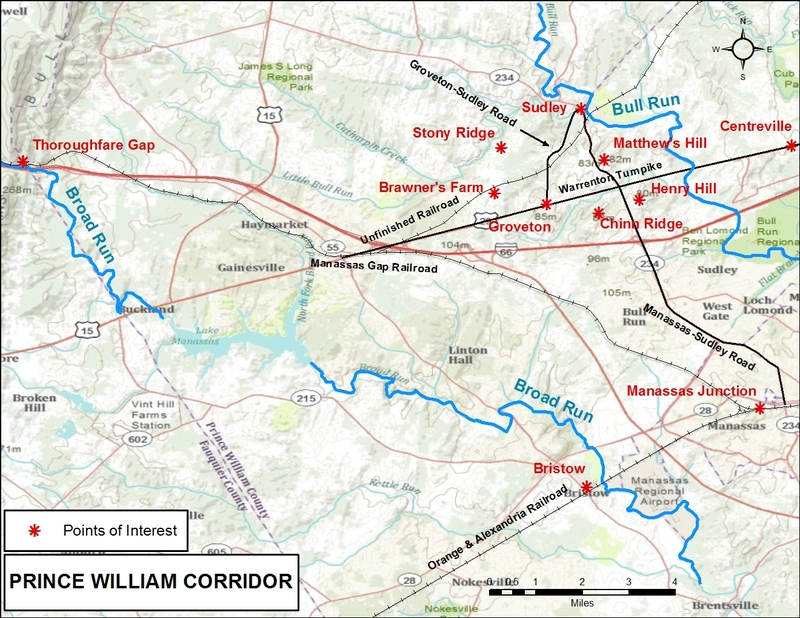 Beauregard sought out these positions based on intelligence reports that Union forces were headed towards Bull Run. Several fords and bridges along an approximate 2.5 mile radius of Bull Run were then guarded by Beauregard’s forces. One of the key choke points was Stone Bridge which was a flat bridge that carried Warrenton Turnpike over Bull Run. Just to the south of the bridge were Ball’s Ford, Lewis Ford, and Island Ford which were all key crossing points from Fairfax County into the Prince William corridor. Union forces had identified that the barrier Confederate forces established became an unwanted obstacle for the Union movement; therefore, they diverted their route in a northwesterly direction to a crossing point that was not being guarded by the Confederates approximately 2 miles north of Stone Bridge. This crossing point was known as Sudley Springs Ford. The geographic prominence of this point provided an opportunity for the Union to surprise attack the Confederate’s flank in addition to blindsiding them from the rear since their attention was faced towards Bull Run. This ford was a slow-moving, shallow crossing that made it ideal for wagons and artillery to pass through thus allowing the Union soldiers to stay dry. Confederate forces became aware of the Union’s diversion and moved north to intercept them as they were traveling south from the hamlet of Sudley. Both forces came to a halt at Matthew’s Hill when the Confederate forces moved into secured positions about 250 yards from the top of the hill on the southern slope. This was a key opportunity for the Confederate forces because the reverse side of the hill provided concealment against enemy fire. When both forces finally initiated the first battle on Matthew’s Hill, it was then realized by the Confederate generals that once on top of the hill, the hill did not provide any real geographic advantage since the top of the hill was open ground. As a result, the Confederate forces retreated because of the lack of a geographic advantage and their disorganized lines. They then relocated to Henry Hill, just south of Matthew’s Hill, in order to regroup. Meanwhile, the Union soldiers seized Matthew’s Hill and dispersed some of their forces to an adjacent location named Dogan Ridge. Henry Hill was situated approximately 1,200 yards west of Bull Run. The Confederate armies had a clear view of the Union forces from here if they attempted to retreat over Stone Bridge. The foreground of the hill was open fields that overlooked a creek to the north named Young’s Branch. On the other side of the creek, the terrain elevated to form Buck Hill, which was only a quarter of a mile from the top of Matthew’s Hill. Both armies stood their ground on top of each of the hills in order to regroup. Once again, the Confederate army’s position on the reverse slope of the hill provided protection from direct fire. When the Union forces approached Henry Hill, the Confederate army encroached onto the higher ground and showered the Union forces with gunfire. The Confederate leverage over the Union assisted them with a huge vantage point in the overall battle. The Confederates continued to hold their position and did not allow Union forces to charge up the slope of the hill. The foreground of Henry Hill was open and treeless, but the fluctuation of small elevation made the Union’s maneuverability difficult because of its uneven grade. The Confederates also used a tree line on the hill for concealment; thus leaving 400 yards of farmland and fields in front of them to devastate the Union army. Eventually, the Union troops diverted their forces to an adjacent, higher elevation location, named Chinn Ridge. Chinn Ridge provided more suitable cover for both armies in this part of the battle. The Union forces used the forested lower level of the ridge named Chinn Branch for concealment when diverting their forces and the Confederate forces also used them when they were in pursuit of the Union forces. The purpose of the entire battle shifting to another key geographic feature was for the Union to gain a geographic advantage over the Confederate forces; however, some of the Confederate forces were still at the base of Henry Hill at the time of the diversion. This new strategy consisted of Union forces moving southward on the peak elevation of Chinn Ridge and then cutting eastward in order to strike the Confederate’s right flank on Henry Hill. Subsequently, the Union forces were not aware of where the Confederate lines were specifically located. This became the Union’s ultimate failure. Due to disorganization in the Union forces, the majority of Confederate forces had shifted their position from Henry Hill and pursued the Union as they climbed uphill on Chinn Ridge. This pursuit surprised the Union forces on the ridge and then forced the Union forces to reverse their line northwest of their previous position. Unfortunately, the Union strategy to attack the Confederate’s on Henry Hill by forming a line in the forests of Chinn Branch and Bald Hill never happened. The result was a Union army that retreated back to Centreville (located on the eastern side of Bull Run), and lost this battle. The Confederate army positioned themselves nearby to Stone Bridge in order to cut off the retreating Union forces; however, the Union retreated back to their entry route via Sudley Springs Ford. Nearly a year after the first Battle of Manassas, another battle in the same area was brewing. Confederate armies began to set up their strategic plan of attack with the use of geographic intelligence gathered by General Thomas “Stonewall” Jackson. He was able to determine exactly where to establish a defensive line. 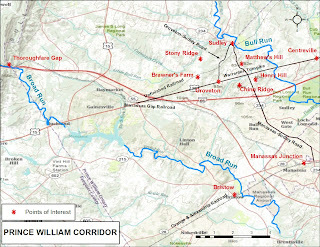 The Confederate and Union armies advanced to the Prince William Corridor, from multiple directions. The Confederates mainly traveled through the Blue Ridge Mountains from Richmond. This strategic area provided concealment and allowed for a safe trip to the battlefield site. They traveled on paths through forests, open fields, and mountainous terrain until the reached Thoroughfare Gap. The first Confederate force, led by General Jackson, passed through the Gap and used Broad Run as a navigational guide to the O & A Railroad which intersected at Bristow. The Confederates realized this was a vital choke point for the Union army and decided to destroy a railroad bridge at the intersection of the railway and creek, as well as ripping up the tracks to ensure the Union forces could not use this line of communication. In addition, these forces traveled several miles northeast along the railway and demolished the Union supply depot at Manassas Junction. This was a devastating blow to the Union army because it hindered their military movement, communications, and logistics for the battle. In the meantime, several Union forces attempted to travel to Manassas via the south and east, but were slowed down due to much disorganization. This provided the Confederate forces to appropriately position themselves in geographic prominent areas within the Prince William corridor. The Confederate forces traveled back to Thoroughfare Gap after the destruction which occurred at Manassas Junction. Since the Gap was located in between the Bull Run and Pond Mountains, it provided protection for the Confederate army. The only direction which the Union forces would be able to approach them was from the east which left the Union forces without option to attack any of their other flanks. As a result, the Gap became a tactical advantage and it was realized that whoever controlled the Gap, controlled the battle. Eventually, more Confederate forces arrived at the Gap. They positioned themselves on the western part of the Gap and waited for the Union forces coming from the eastern opening, while other Confederate forces continued on to Stony Ridge to the east. Shortly thereafter, Union forces arrived at the eastern part of the Gap and barricaded the entrance leading out to the Culpeper Basin. In the wooden areas surrounding the Gap’s entrance, Union forces cut down trees and made the Gap impassible for Confederate forces, which ultimately did slow them down. In less than 24 hours later, the Confederates, along with their artillery, ordnance, and wagons that accompanied them, crossed through the narrow passage that was barricaded and were able to join their counterparts at Stony Ridge. The next vital geographic area in the battle was at Stony Ridge. It is a ridge that runs southwest to northeast. On its eastern side away from the Bull Run Mountains, it is protected by dense forests as well as trenches and banks that make up the railroad bed that was left unfinished prior to the Civil War. The original Confederate forces that destroyed the depot at Manassas Junction and left the Gap before Union forces blocked it traveled to the Stony Ridge area to establish a defensive line as well as a hideout. This location was ideal for the soldiers because the forest provided concealment, and leverage due to the elevation. Also, an unfinished railroad provided a 100-foot deep depression in the ground which allowed for a surprise attack against the approaching Union forces. The Ridge also had diabase which resulted in hard rock and boulders making it tough for Union forces to rush the Confederate forces. When the Union forces finally arrived at the Confederate hideout, the Confederate forces ambushed them allowing a devastating blow to the Union flanks. The Union was eventually forced into an open field around a local citizen’s property named Brawner’s Farm. At this point the Confederate forces at the Thoroughfare Gap finally arrived on scene and also attacked the Union forces by way of Warrenton Turnpike. The open field did not provide any advantage to the Union soldiers as they were not able to fully engage their enemy. In addition, there were still Confederate soldiers attacking from the unfinished railroad site, and the higher elevation. The only assistance that the terrain offered the Union forces was several shallow depressions encased with streams that were tributaries of Dogan Run. The streams provided minimal protection since they were on the lower ground. Some of the soldiers on both sides ran out of ammunition and decided to throw superficial, exposed rocks as a substitute. As a result, the Union forces were unable to drive the Confederate forces out from their tactical ground and had no other option but to pull back further east to Manassas-Sudley Road. In an attempt to regroup, the majority of Union forces formed lines along Chinn Ridge, Matthews Hill, and Henry Hill since the Union leadership was familiar with these locations from the first battle. Their numbers were so small that the Confederate forces charged them at every angle. Subsequently, the Union forces did not have any geographic advantage over the Confederate forces and finally retreated back towards Washington via thick woods to conceal their departing route; thus the Confederates had achieved another victory. Overall, the studying of geographic factors of an area is essential for planning and executing a battle. The topography, hydrography, geology, and lines of communication all integrated together to assist in the outcomes of the battles. Ultimately, the Union failed to execute a successful strategy largely based upon the unknown terrain; yet, it provided an advantage to the Confederacy. In addition, the Confederate army had the topographical knowledge and the assistance of local farmers as food sources and guides. The Blue Ridge Mountains provided a good majority of natural resources needed for war such as coal for heat, salt for preserving food, and saltpeter for gunpowder which also gave them an edge towards victory. However, both sides became victims of fatigue, disorganization, and insufficient ammunition supply. Confederate forces used geography to their advantage by pushing the Union troops back towards a retreat in both battles. On the other hand, the Union commanders approximated the location of the Confederate army erroneously which resulted in failing results for the Union. Victories are determined by many factors, but the main factor relies heavily on the geographic prominence and attributes that militaries use for an advantage, as the battles of Manassas proved. Lastly, the battles at Manassas set the pace for modern geographic intelligence through aerial surveillance. This assessment on the geographic factors that affected the outcomes of the battles is a prime example of what happens to an army when they do not have accurate information regarding the geography of an area. It ultimately results in a win or loss. As a result, U.S. engineers embarked on huge mapping projects after the first battle for these reasons in order to obtain better geographic intelligence. Today, our nation stands on the forefront of the world by producing the most vital geographic intelligence because of technological advances in aerial and space surveillance. For these reasons, geography played an effective role in determining the course and outcome of both battles in Manassas, as well as the battles occurring overseas every day. Collins, J. M. (1998). Military geography for professionals and the public. Washington, DC: National Defense University Press. Gottfried, B. M. (2009). The maps of First Bull Run: An atlas of the First Bull Run (Manassas) Campaign, including the Battle of Ball's Bluff, June-October 1861. El Dorado Hills, Calif: Savas Beatie. Publishers in association with History Book Club. Manassas. Shippensburg, PA: White Mane Books. terrain in the conduct of war. Baltimore: Johns Hopkins University Press. Hi, I was wondering what sources you used in the creation of this article. It would be a great help for my school project if you'd respond soon. Thanks.